What better way to start Morgan Freeman month than to pair him with last months spotlighted actress, Ashley Judd. They make a great acting team and I hope to see them join up again soon. High Crimes is a mystery-thriller based on the novel written by Joseph Finder. Other books written by Joseph Finder include Company Man, Killer Instinct (2006), Power Play (2007) and Paranoia (2004), his book-to-movie coming out this summer (2013) starring Harrison Ford. Screenplay for High Crimes was written by Yuri Zeltser and Grace Cary Bickley and directed by Carl Franklin. In this flick, Ashley Judd plays the role of Claire Kubik. Like in Double Jeopardy, Judd is a blissfully married woman, a character type she plays very well. Professionally, Claire is a successful defense attorney with a bull dog approach which will come in handy as the movie progresses. Her good looking attentive husband Tom is played by Jim Caviezel. The only thing these two people have missing in their lives is a baby. As the plot is laid out, there is a break-in at Claire and Tom’s house in the middle of the night. One afternoon shortly thereafter, while strolling down the street together, Tom is abruptly arrested. You, like Claire, ask “What’s going on here?” Well, it seems that Tom’s been living a double life. He is really Ron Chapman, a former Marine accused of murdering nine civilians during a military assignment gone wrong in El Salvador. When she questions him about it, he admits his name is Chapman but swears to his innocence. He says he was framed by Colonel Marks, now Brigadier General Marks and his top aid Hernandez. Standing by her man, Claire takes leave from her job and moves to California. Military attorney newbie Lt. Terrence Embry, played by Adam Scott, is assigned to Tom’s case. Claire feels Lt. Embry is not qualified to represent her husband alone so she signs onto the case to assist in her husband’s defense. In addition, she sets out to find a local attorney to team up with, someone who has worked military cases and is hungry to beat them. This is where Morgan Freeman comes in, playing Charlie Grimes, formerly JAG Corp (military legal service), now private attorney, 486 days into sobriety. The movie really takes off from here as Claire and Grimes uncover information to prove Tom’s innocence. It is very engaging and the plot is very well built with lots of twists and turns- a perfect recipe for a mystery-thriller. As the clues unfold you’ll find yourself asking questions like: Is this a cover up? Is it a conspiracy? Is Tom guilty? Is Tom innocent? Who knows? You’ll have to watch the movie to find out. Trust me, it’ll be fun! There is more to High Crimes than just a twisty thrilling plot making it all the more interesting and fun to watch. First, the movie name High Crimes rhymes with Freeman character name Grimes. Hmmm! Was that on purpose? Second, Charlie calls Embry “embryo” because he is a developing young attorney. I thought that was pretty cleaver. Thirdly, Charlie rides a Harley. That’s right, a Harley Davidson motorcycle. Can you believe that? I thought that was a pretty funny choice. If for no other reason, you need to watch this movie just to see Morgan Freeman on a motorcycle – goggles, helmet and all. And last but not least, there was a scene where Charlie followed the prosecutor to a bar. Inside he spotted Marks and Hernandez. As he scanned the room, guess who else he spotted? Our wet behind the ears attorney, Lt. Embry. Ut-oh! Not good! The next scene when Charlie sees Embry he confronts him saying, “Lucy! You got some splainin’ to do!” mimicking Ricky Ricardo’s famous catch phrase from the 1950’s show “I Love Lucy.” It was priceless! 1. What holiday weekend was it when movie started? 2. What beer is advertised behind pool table? 3. What time of year was Claire’s house broken into? 4. The line “Stand by your man” was used by the press in this movie describing Claire. What country western co-wrote and sang this song in 1968? 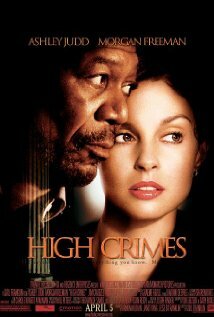 This entry was posted in Ashley Judd, Morgan Freeman and tagged Ashley Judd, drama, High Crimes, morgan freeman, Thriller. Bookmark the permalink.